Mochulsky comes across fairly positively in his account, even if today’s reader is frequently frustrated by his lack of introspection and personal accountability. He is remarkably resourceful at problem solving, and seems genuinely concerned with the physical well being of the prisoners. As Deborah writes in her afterward, perhaps Mochulsky “was a man who want[s] to show us that even in an evil system there were people who tried to do their best”.1 I’m very curious about the issue of the “good boss”—the boss who, in other words, treats the prisoners humanely, while continuing to maintain a position of power and responsibility within this incredibly cruel and inhumane system. In my own research, I’ve come across one possible “good boss” candidate, who, like Mochulsky, commanded a sub-camp within a much larger camp complex. How possible/common was the “good boss”? What do we make of some of the silences in Mochulsky’s memoir? “A person?” roared The Boar, “There aren’t any here! Here are enemies of the people, traitors of the Motherland, bandits, crooks (zhuliki). The dregs of humanity, scum (mraz’), riff-raff (podonki), that’s who is here! Just as an aside, the journal issue itself is fascinating. Put together by a division of the Federal Penitentiary Service, the Kuzbass UIS (Ugolovnaia ispolnitel’naia sistema), it is a special issue titled, “130 years of the UIS”. In other words, the founding of the UIS is dated to the tsarist period, emphasizing continuity through the Soviet period to the present day! In any case, to get to my second question: just how “good” was Mochulsky? I want to take him at face value, and I admire his ability to find secure sources of food for prisoners under his command, and to ensure that they at least had rudimentary shelter. Yet there were a few points that nagged at me – silences in the text. For example, he describes some instances of problem solving—finding alternative food sources, convincing work refusers to work—in great detail, yet other instances receive almost no elucidation. Following the outbreak of the war, Mochulsky begins inspecting the track at night (along with his daytime inspections), and this immediately increased labor discipline on the night shift.7 Mochulsky credits his presence for the change (“prisoners understood that their work could at any moment be checked”), but are we really to believe that no coercion was involved? Why the lack of detailed description, here? 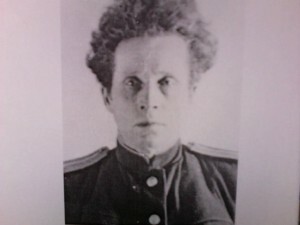 Later, as boss of the militarized section of the railway, Mochulsky writes, “I only dealt with the prisoners as a labor force. I did not have anything to do with their maintenance or daily lives”.8 He does not explain exactly what he means by this statement, but one can certainly infer that, at this point, the prisoners’ daily lives were miserable, and Mochulsky is trying to absolve himself of blame (and, perhaps, feels guilty). Still, overall I agree with Jeff – it matters that Mochulsky tried—and at times succeeded—in being a good boss in an overwhelming cruel and violent system. Wilson: Interesting post. I liked finding out about Kazachenko, just because I think we all want to believe that not every boss was evil, or made evil by the institution. Only one other boss springs to mind, and that is Eduard Berzin (mentioned in Applebaum, p. 85). It seems that as boss of Vishlag he built the inmates theaters and dining halls, paid them salaries, and so on. But Applebaum goes on to say that the other, unlucky Vishlag prisoners appear to have been sent to small forestry lagpunkty where death rates were higher, and where they were evidently tortured or murdered. So Berzin wasn’t that good after all, if we are to believe Applebaum. As an aside, when I listened to all those Shoah Foundation interviews, a few of the people compared the Gulag to their time in the Nazi camps, and said that conditions were better in the Gulag. For instance, there were *sometimes* doctors in the camp, and *sometimes* they cared for the prisoners and gave them hospital time, thereby saving their lives. Of course, that’s not a boss, that’s a doctor. But it does say that there was room and energy now and then for a good person in an evil place to work. I agree with you on the blank spots in Mochulsky’s account. Why didn’t he ever say his prisoners were dying on him, or that he had to coerce them to work? If his life depended on getting the job done, then he probably had to use more than persuasion. Thanks, Deborah. The issue of Gulag doctors is an interesting one; if I’m not mistaken, Dan Healey is working on this topic, now. Many doctors were prisoners or ex-prisoners, so some degree of humane treatment makes sense. Doctors, however, had to decide how “fit” prisoners were for physical labor, and doctors ranked the prisoners into categories based on their physical capabilities. In this way, doctors no doubt contributed to the overwork of countless prisoners. On the other hand, if a prisoner was granted “invalid” status, the medical staff generally worked to help that prisoner get better (if at all possible – many prisoners who were too ill to work simply died or were released). So, there’s a bit of a paradox: the system would work prisoners close to death, and then try to heal them. Why not treat them better in the first place? This is such an fascinating piece, Wilson! It’s interesting to think about the choices that were really available to people who managed the prisoners. Mochulsky wasn’t an NKVD boss, so I guess this would partly explain why he was troubled by what he experienced. He still had a conscience. It’s also striking that Mochulsky never described the prisoners’ starvation and the system of physical exploitation, as Deborah says. I was wondering about this too. He just didn’t want to go there: “I only dealt with prisoners as a labor force.” It was as if he coped best when he compartmentalized his function, and didn’t think too much about “daily life,” like food (not his pay grade). As for the doctors, I have been working with the sanotdel files quite a bit, and my sense is that doctors had little authority to be truly helpful, although a day’s rest was huge for these prisoners, even if rest was rationed. It’s not surprising that many inmates had something nice to say about one of the doctors and nurses, but just as many have disparaging remarks for the gulag medical staff too. As Solzhenitsyn said in his criticism of Shalamov’s praise of doctors– yes, doctors COULD help, just as anyone in a position of authority could help, but they often did not. I can’t resist saying something about the specific case of Gulag doctors, in response to these comments from Wilson and Golfo. Gulag doctors did indeed have little authority – and few resources – with which to treat patient-prisoners humanely. The Gulag let millions of prisoners die before they could receive adequate medical attention, or even if they did. But my reading of the memoirs of Gulag medics (at Memorial in Moscow and St Petersburg, published medics’ accounts, and the personal papers of medics held at the Ukhta Museum of Public Health and in Magadan’s Regional Museum), plus interviews with Gulag doctors, and indeed the official sources including the Sanotdel records, leads me to think that their influence was, on balance, far more beneficial to prisoner welfare than Solzhenitsyn would have us believe. Why did Solzhenitsyn avoid composing a chapter specifically about the camp infirmary and medical system? In three volumes of The Gulag Archipelago there is no attempt to look at the issue squarely and systematically. (Compare this deliberate decision to his devotion of a chapter to the arts in the camps, entitled ‘The Muses in Gulag’, in volume 2, for example.) Solzhenitsyn evades a direct examination of the question because the paradox of Gulag medicine and its multifarious effects would muddy his profoundly anti-Communist moral stance. In a similar fashion, Anne Applebaum (who in many ways imitates Solzhenitsyn’s structure and thesis in her Gulag: A History) devotes just 9 pages of inconclusive and slippery discussion to the sanchast in her 530-page account. An account that seeks to understand what Gulag medicine accomplished might treat it more seriously and less evasively, one would think. Another point I’d like to make is that Shalamov’s views on Gulag medicine were far more ambivalent than Solzhenitsyn makes out in his diatribes against him in Gulag Archipelago. In Shalamov’s memoirs we see a profoundly ambiguous attitude toward the Gulag doctors he worked with, whether prisoners, ex-prisoners, or freely hired. He is keenly aware of the human faults and petty wickedness of the doctors he worked with and even befriended. His is a less thunderous and more realistic assessment of human nature than Solzhenitsyn’s, and I am willing to bet that his portraits of Gulag doctors are more plausible than those presented to us by Alexander Solzhenitsyn. I think the question of “good” or “bad” bosses in the Gulag cannot be satisfactorily answered, and that a more productive, and interesting, model of human nature expects to find “good” and “evil” combined in every human heart, as Mikhail Bulgakov wisely taught us.